Many thanks to Richard Venus for his memories of when he was evacuated to Yeovil from London in 1939, staying as our guest until 1942. [Note - anything in Richard's text contained in square brackets is mine]. For Yeovil's Evacuation Plans click here. "In September 1939 I was evacuated to Yeovil in Somerset with the John Ruskin School [Elephant & Castle, London]. I was seven at the time. I remember waving goodbye to Mum but cannot remember much more than that or even where we said goodbye. 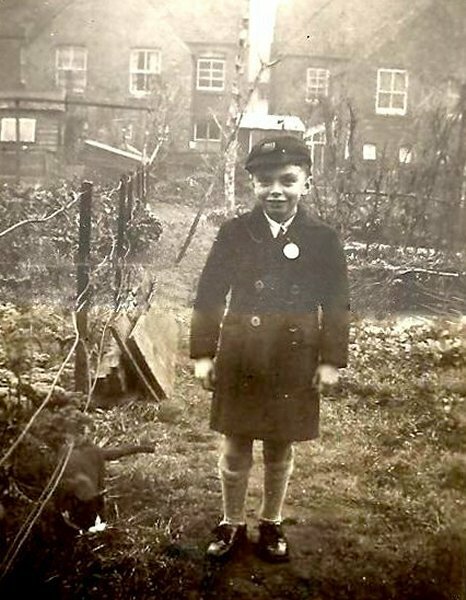 There seemed to be no plan as to where we were to stay and I can remember walking the streets of Yeovil in the dark with grown-ups knocking at doors asking people if they would take an evacuee. My friend Billy Russell and I were originally billeted with a widower and his son very close to Westland Aerodrome. I assume he was a widower as there wasn't a woman in the house. The son, to my eyes, was probably about sixteen to eighteen but a “big boy”. The widower used to give us money each day and we spent this on potato puffs at the local fish and chip shop. These were potato crisps in a batter and they were lovely. I don't think they were very healthy as a diet as I remember having water blisters on my feet. This could have been caused by wearing welly boots all day. They were very painful when they burst. We only stayed with them for a while before Mum came down and found Billy and me somewhere better for us to stay. Some time before Christmas 1939 Mum found a Mr & Mrs Daleymount at 10 Seaton Road to look after us. They were nice people with no children of their own and the only disadvantage being was that they would have preferred a girl. It didn’t affect me too much being only 7 years old but they let my hair grow, gave me a pinny which I wore indoors and taught me to sew and darn. I didn’t mind as these skills came in handy when I went into the Air Force for my National Service. 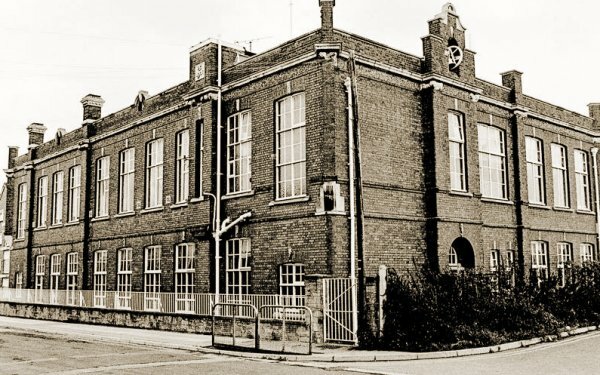 Memories of this time include going to school (not sure what school or where it was) [it was Huish School] next to a large army vehicle depot, [this was a temporary wartime depot in Fairfield], having a scooter with large (about 8") wheels on which I could do anything including sitting on the handle bars. It had a brake to the rear wheel and at one time the handle sheared off and I was so upset that Mrs Daleymount had it re-welded. Living next door was a fair haired girl called Joy (see Gallery below) who I alternately played with and fell out with. 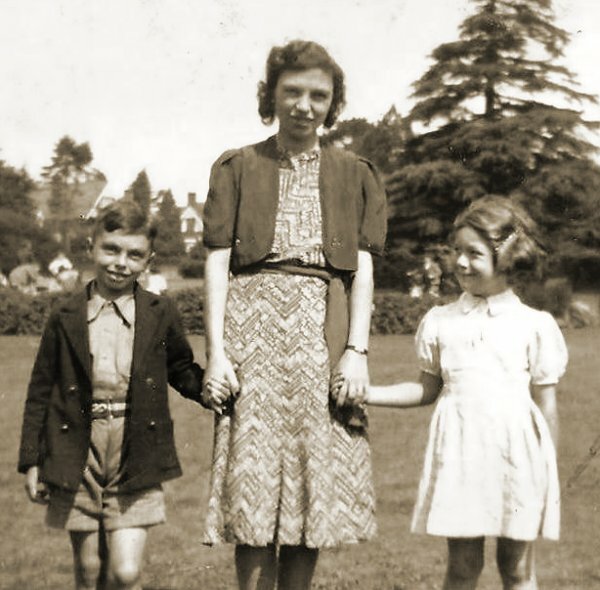 I also remember visiting Mrs Daleymount's niece and nephew (they were called Helen and Peter) who were very nice. I remember we had to learn a text from the bible each Sunday for Sunday school. The niece, the elder, helped me learn them. I remember the air raids which I seem to recall we had quite regularly. We didn't have an air raid shelter at this time so hid under the dining room table. I can remember the droning bombers and the whistling of the bombs. I can remember that my tummy always seem to rumble when the aircraft were going over and Mrs Daleymount told me to keep quiet as the Germans would be able to hear me. I quite believed her. When we first had our gas masks we had practices at school so that we could put them on quickly if necessary. Down in the town they sometimes let off tear gas capsules as practice. 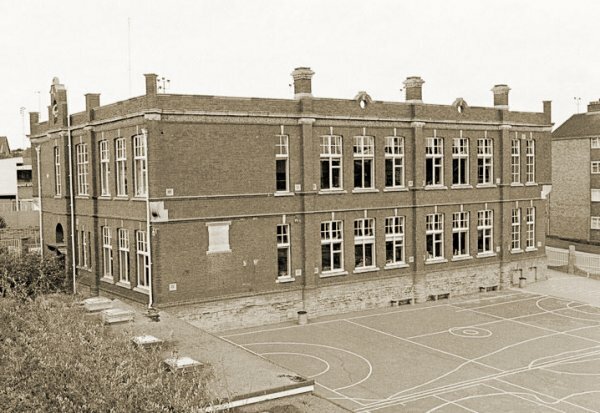 At school we all hoped to be caught in a practice but I never did. My favourite aeroplane is the Westland Lysander built and flown from Yeovil. We used to see them coming and going all day. They were the aircraft that took our secret agents into France. I think we had air raids in Yeovil before they had them in London. What a place to send evacuees! I saw a British aircraft, not a Lysander, hit a barrage balloon cable which took off the end of its wing and it just twisted round and round to the ground out of sight and then I heard a bang followed by a column of smoke. I don’t know what happened to the airman. Just before Christmas 1942 Mr Daleymount became sick and Mum took me back to London. I recall going back to Yeovil whilst he was ill. He was covered with sores and that was the last time I saw him. I think it must have been some sort of skin cancer. I didn’t return to Yeovil after Christmas." This is Richard, ready to be evacuated to Yeovil from London in his school cap and an overcoat with a label on its collar saying who he was. Photographed in 1939. Courtesy of Richard Venus. 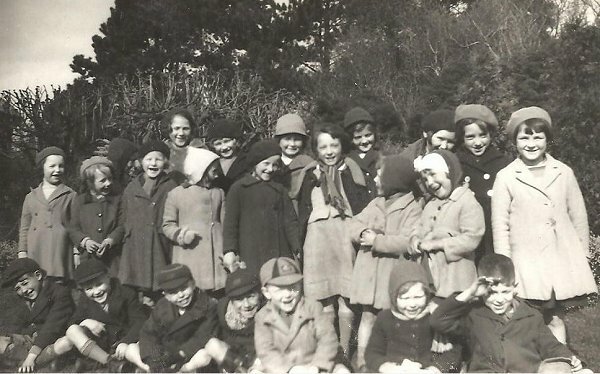 This photograph features in my book "A-Z of Yeovil"
Richard (front row, third from left) and his classmates. Photographed in 1940. 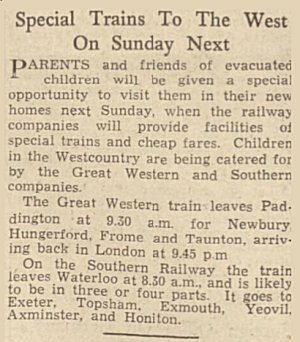 Notice of special cheap return fares for parents to visit their evacuee children in the Western Morning News of 30 November 1940. Richard and his Mum, with Joy (his neighbour in Seaton Road). This photograph was taken in Sidney Gardens. Photographed in 1940. 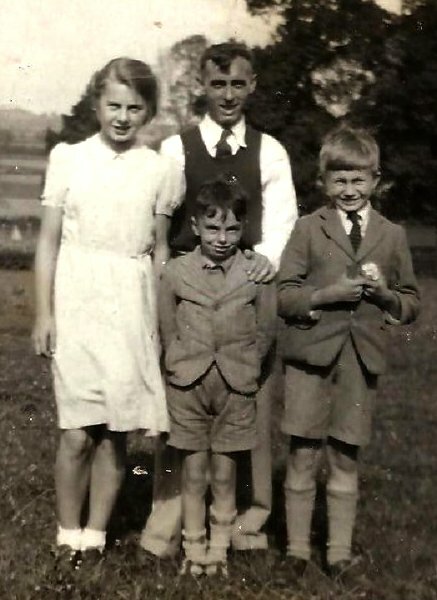 Richard and his Dad with Mrs Daleymount's niece and nephew, Helen and Peter. Photographed in 1940. 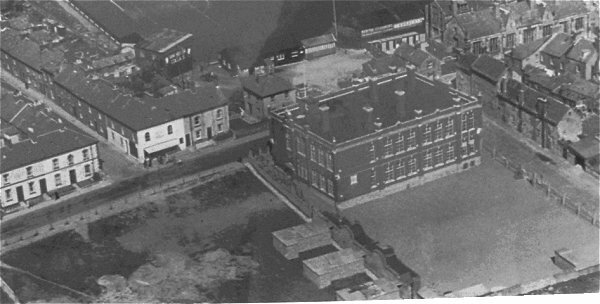 This aerial photograph taken in the 1950's shows Huish running from centre left to top right with Huish School right of centre. In the lower left quadrant is Fairfield, used as a temporary military transport depot during the Second World War. Richard attended Huish School during his stay in Yeovil. Seen here from Huish, the school was demolished in the early 1990s and is now the site of Tesco's filling station. .... and Huish School seen from the rear. 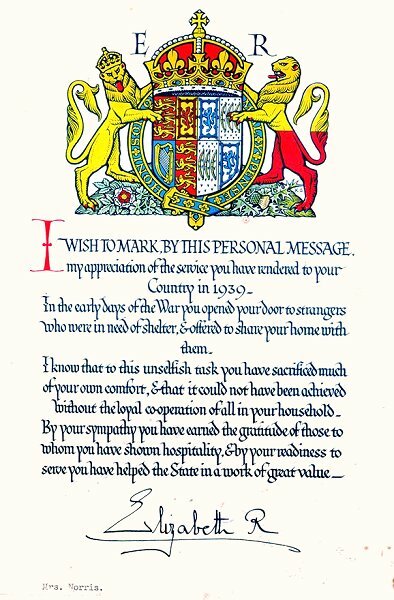 This is the letter of thanks sent by HM the Queen to all those who took in evacuees. This particular letter was sent to Mrs Norris of Westland Road (Roger's grandmother).